Videos of baby and adult rat wrestling. 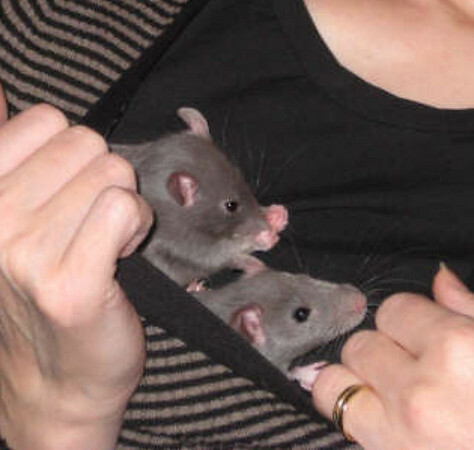 Are your babies or new rats being too aggressive with each other? These snapshots of normal play will help you decide. Typical baby rat wrestling. Nine-week-old Ziggy and Otis show us how to do it. Thanks to Amanda in Norwich, Norfolk, United Kingdom, for sharing this video. Baby rats play wrestling. This is normal baby play. It can look very aggressive, but if it has certain characteristics, you can call it play. The babies should take all roles: flipper rat, flipped rat, "winner," and "loser." There might be very loud squeaks of protest, but as long as no blood is drawn, they are finding their proper places in the hierarchy of their mischief. Now we watch "My two, 10-week old baby rats, Ptolomy (black banded roan) and McClane (pale grey roan) having playtime." More fierce play wrestling. These behaviors are normal! 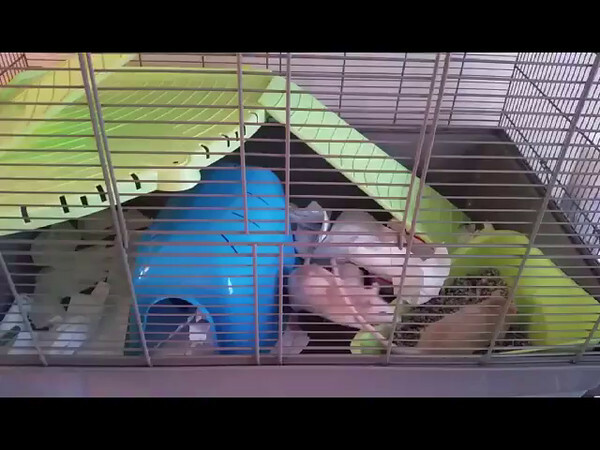 My own two and one-half YEAR old rats still occassionally wrestle with each other in just this fashion. Midnight and Lefteye, adults rats, do a lot of boxing, sidling, and poofy displays. Their owner is very calm about assessing their behavior as friendly. We can see the same behaviors in overly-aggressive rats. How to tell the difference? What is the history of the rats' relationship? Are they friendly to each other in other contexts - do they sleep together, hang out together, etc.? Do either of the rats cringe or freeze in place when the other rat approaches, indicating an inequality between them? Does this same play behavior occur in small confined settings, or over food or some other resource, where the concept of dominance would be relevant? Please do not just assume that if your rats are demonstrating the same behaviors as Midnight and Lefteye, that "all is Okay". It may not be. Baby Luna playing from inside the cage with her human's fingers outside the cage. I suggest bringing the baby out to play. Inside the cage, is very safe. Outside the cage, not so safe until the human teaches the baby it's okay. Exposing the baby to a confined area where the cage is absent, will help the human and baby become more bonded in this kind of play. Rose, Si, Am and Camille, showing off more baby rat wrestling. Are my rats playing, or fighting? A common question. This gallery contains videos of normal play behavior in pet rats. Kate's two new blue girls, Sapphire and Angel, in the safety of a human shirt.